today. I'm a big fan of sequins and here lately, you'll generally always see a few sprinkled on my creations. 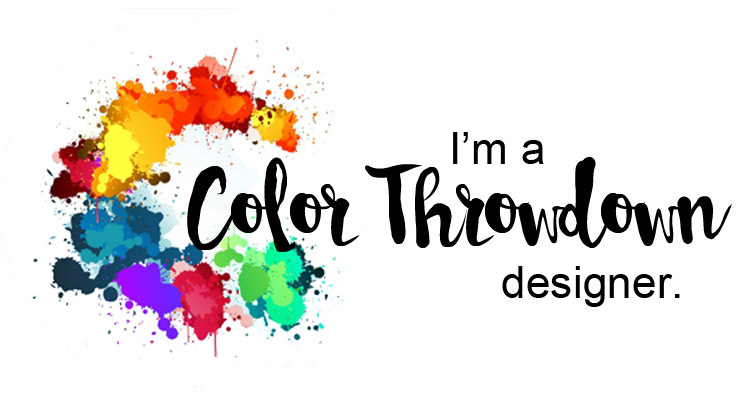 My favorites are from Avery Elle where the color families have varying sizes and shades of color in each package. 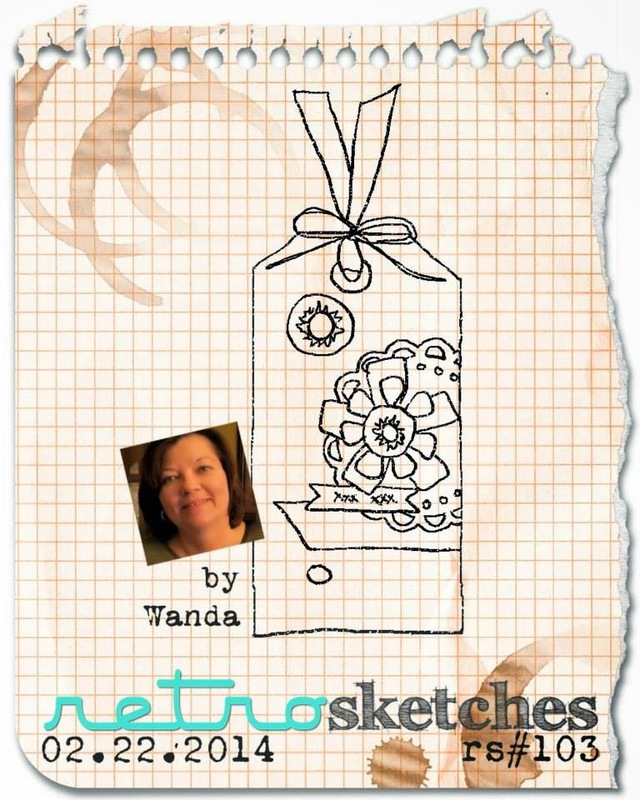 I'm also playing along with Chupa's Sketchbook Saturday Challenge - isn't that a fabulous layout?! I thought it would be perfect to sneak peek some new ODBD goodies that will be released tomorrow! 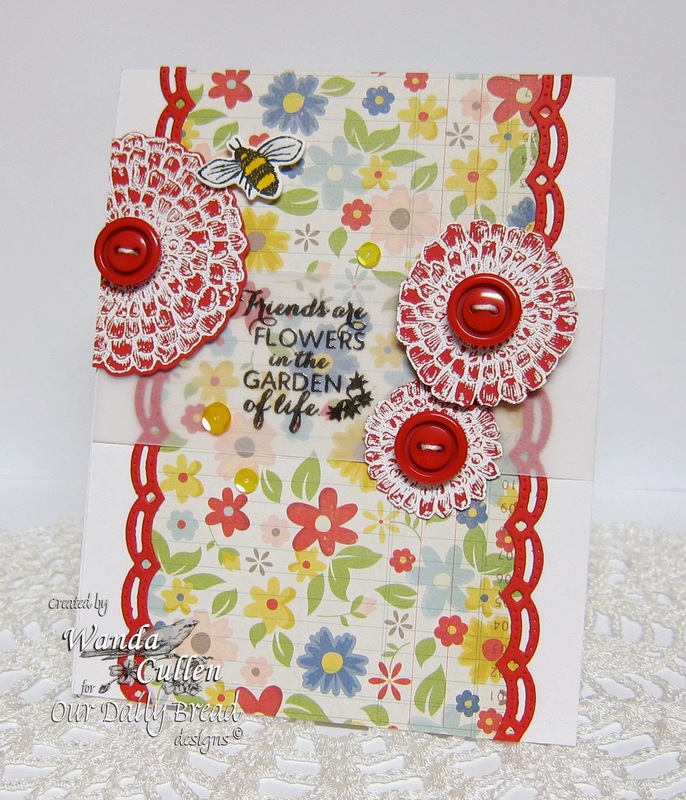 The bumblebee and zinnias are from the Zinnia stamp set which has matching dies available as well. The largest zinnia on this card is actually the smallest of two zinnia images. I wanted varying sizes for this sketch, so stamped the flower 3 times and fussy cut two smaller sizes. I used Stampendous Detail White EP on Real Red cardstock. 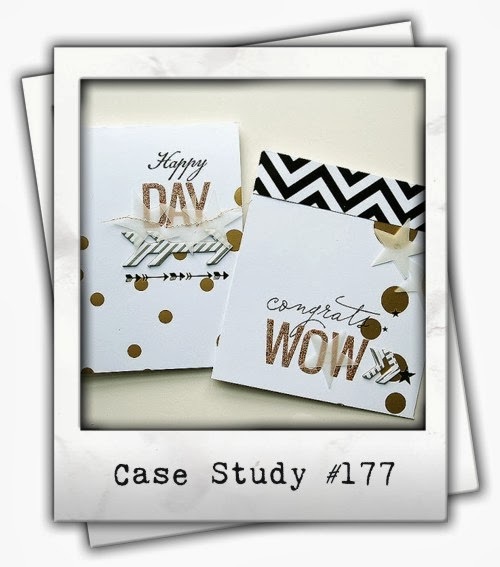 The sentiment was stamped with Versafine Onyx Black on vellum and clear embossed. Notice the border? I took one of ODBD Beautiful Border dies from their February release and trimmed off the narrow scalloped portion. It's a way to get more bang for your buck - lol! I love trying to think outside of the box with my supplies! Thanks so much for stopping by...TGIF and I have the day off! I'm working on LOTS of laundry today then need to run some errands. Happy hump day everyone! 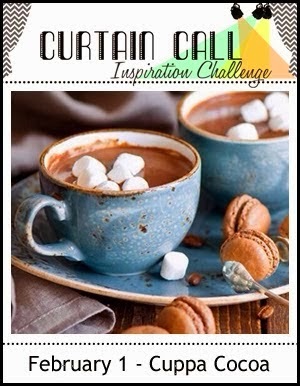 Monika has a really yummy combo for the Color Throwdown Challenge this week! 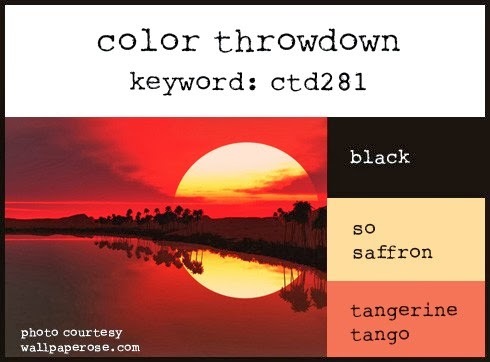 Don't you just love that sunset photo? 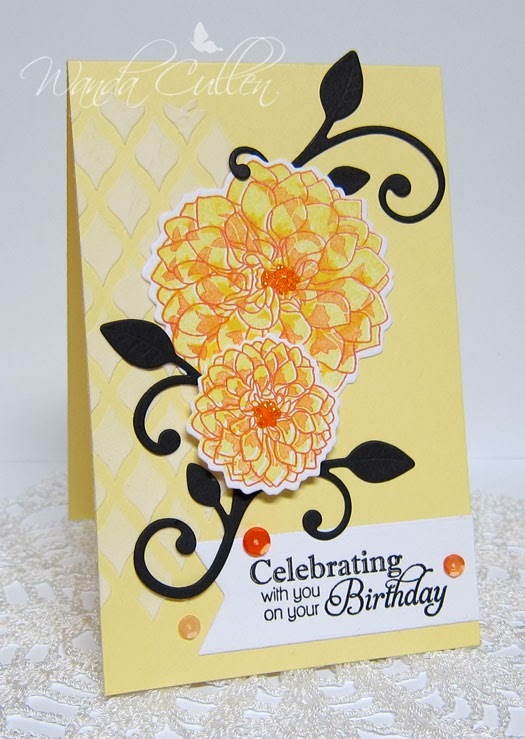 I thought I'd pull out my Delightful Dahlia set and create some 3 step stamped flowers. I started with adding some texture to the card base using Liquitex modeling paste and MFT's fishnet stencil. Then the boo boos began! It was originally an A2 card until I smeared some orange Stickles on the lower left corner. It then morphed into a tall and skinny card - 3 1/2" x 5 1/2". 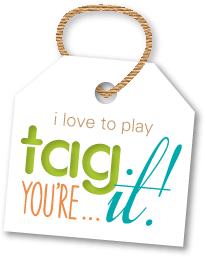 :-) I then went to stamp the sentiment and...yep...you guessed it! I didn't have it perfectly straight, so had to go to plan B and add the sentiment flag! Moral of the story...be patient - lol! I was still happy with the outcome since it's going to the mother of a coworker who is celebrating a 94th birthday this week. Can't wait to see you in the gallery! Remember, you could be our next guest star stamper for the following week's challenge if you play along! 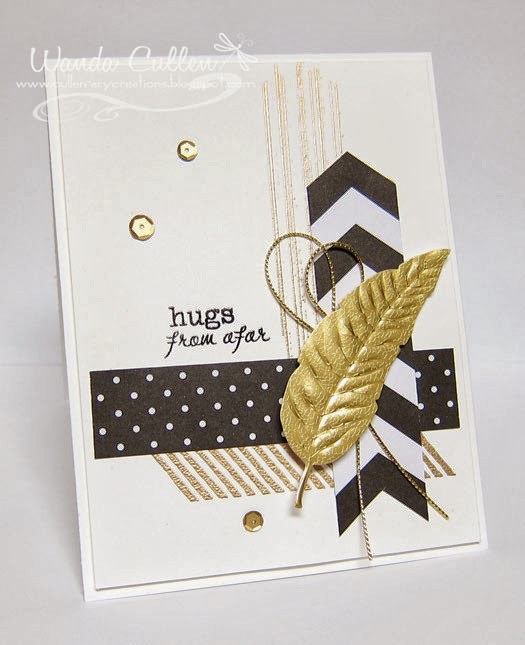 ACCESSORIES: Leafy flourish Die-Namics by MFT, Fishtail Flags Die-Namics by MFT, Liquitex light modeling paste, Avery Elle Citrus Blend sequins, MFT Fishnet stencil. Hello everyone! Can you believe it's Mojo Monday Challenge time already? Have to say I'm always glad to see February end as it's my least fave month of the year! Since it's the last Monday of the month - a tall and skinny card is on the menu. My finished card is 3 1/2" x 5 1/2". 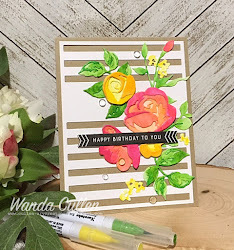 Just love this size because I have the option of letting some elements "hang" over the edge of the card and it will still fit in an A2 envelope. 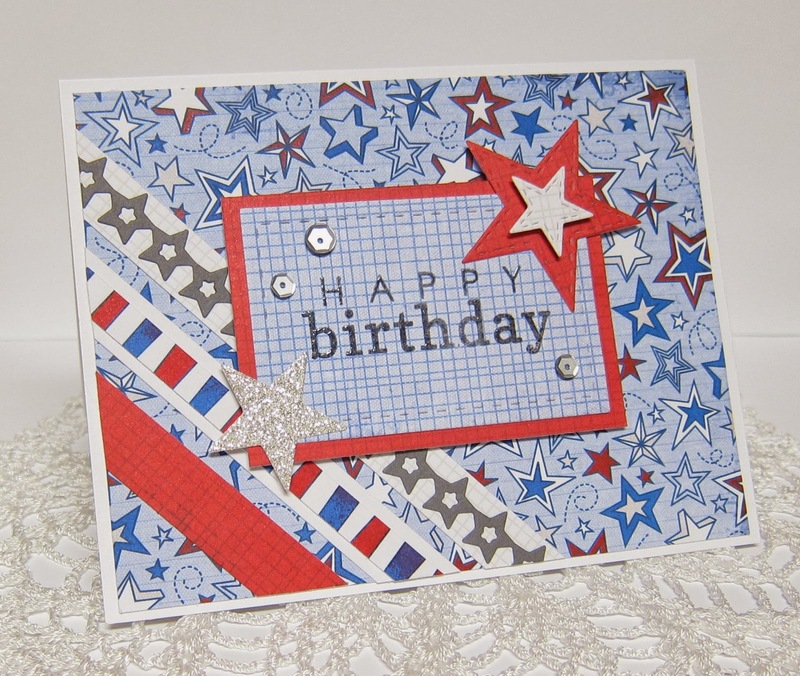 ACCESSORIES: Clear embossing powder, Stitched cloud, sun, circle dies by Lil Inker Designs, Fishtail Flags Die-Namics by MFT, Pastel sequins by Verve. Thanks to Arielle and her team for having me as a guest! Have no fear...I'll be a frequent flyer in the Retrosketches gallery as long as my fingers are able to get inky - lol! Hopefully, you've already been to the ODBD store and ordered some new stamps and dies from their February release. 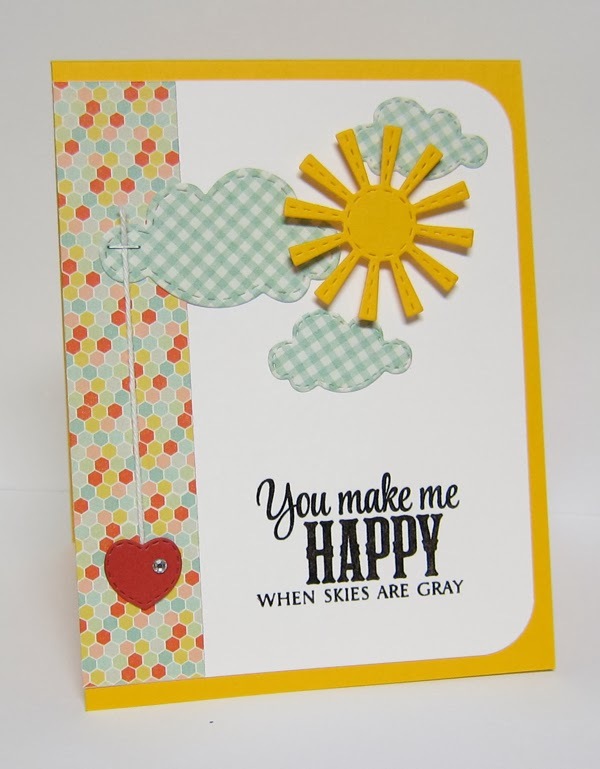 I've had a great time playing with their new February release goodies and have another sample to enable you! :-) I went with some subway art to show all the sweet little sentiments in the Be Mine set. 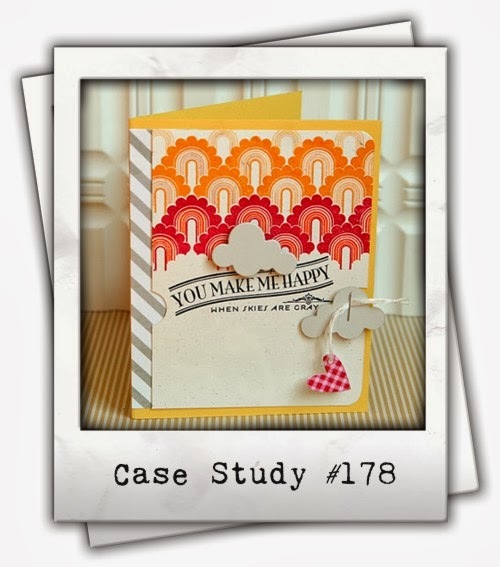 I first stamped the filigree heart image from the Bless Your Heart set using Unicorn white pigment ink on a die cut kraft heart (ODBD Custom Ornate Hearts die) then added the tiny sentiments. 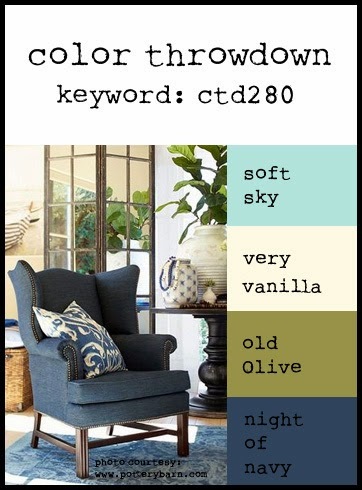 For more inspiration using the February release, be sure to visit the ODBD blog where you'll find the designers' blogs on this page. 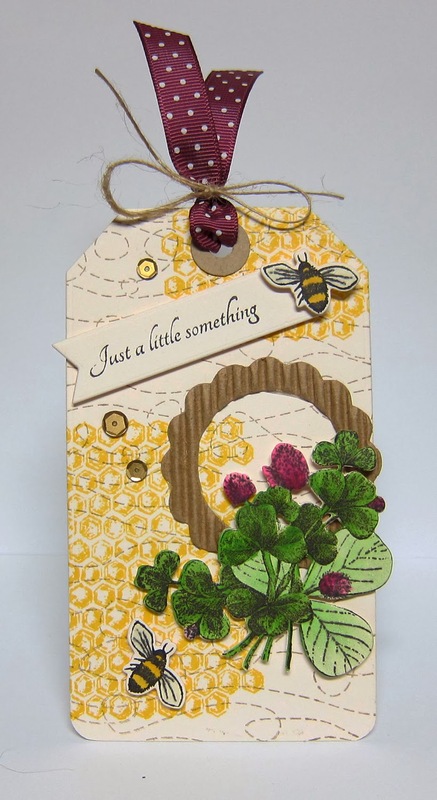 ACCESSORIES: Hexagon die by SB, TCW Mini Hexagons stencil, Rolled Roses Die-Namics by MFT, Medium Leafy Flourish Die-Namics by MFT, Tiny Tags die by PTI, Avery Elle Lucky Blend sequins, Pearls (colored with Copic marker B37). Can't wait to see you in the gallery! Remember, you could be our guest star stamper for the following week's challenge if you play along! 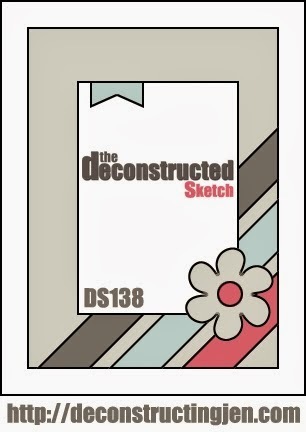 Didn't have much time for creating this morning, so this is a really quick and simple card for Reverse Confetti's February Color Challenge and it uses Jen's sketch for the Deconstructed Sketch Challenge #138. Obviously I flipped the orientation of the layout to a horizontal version so I could use this birthday sentiment. Pretty straight forward...I used Lil Inker Designs' stitched stars and rectangle dies. 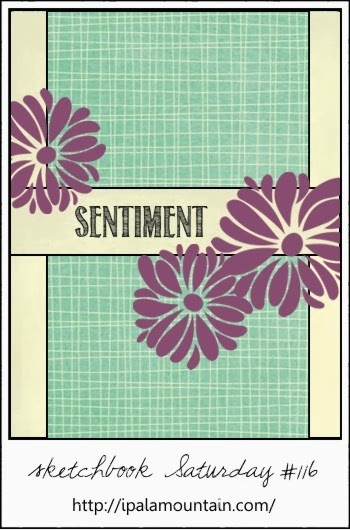 The sentiment is from Reverse Confetti's "Lots to Say" set - stamped in Basic Gray and clear embossed. 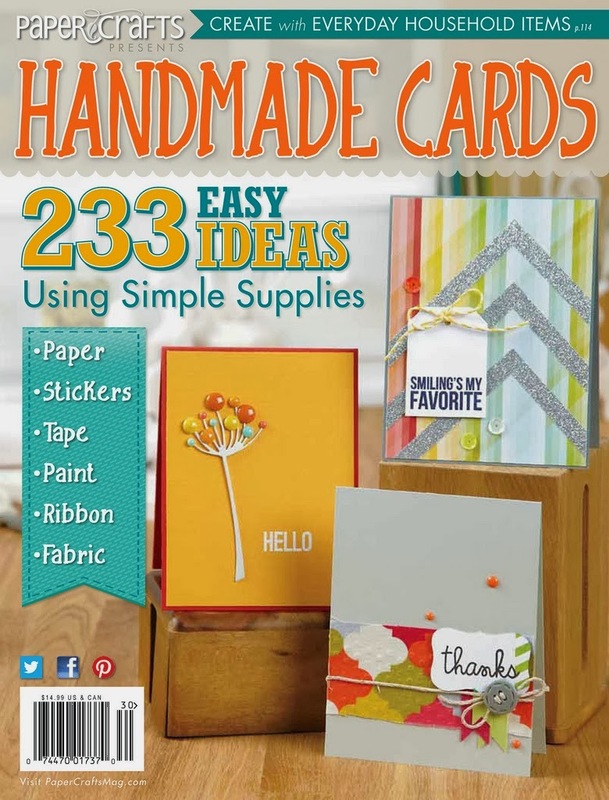 Designer paper is from We R Memory Keeper's Yankee Doodles 6x6 pad. Thanks for stopping by...off to the shower then heading to work. Good Monday to all! I'm looking forward to a sunny week after the huge snowfall we got here in VA last week! 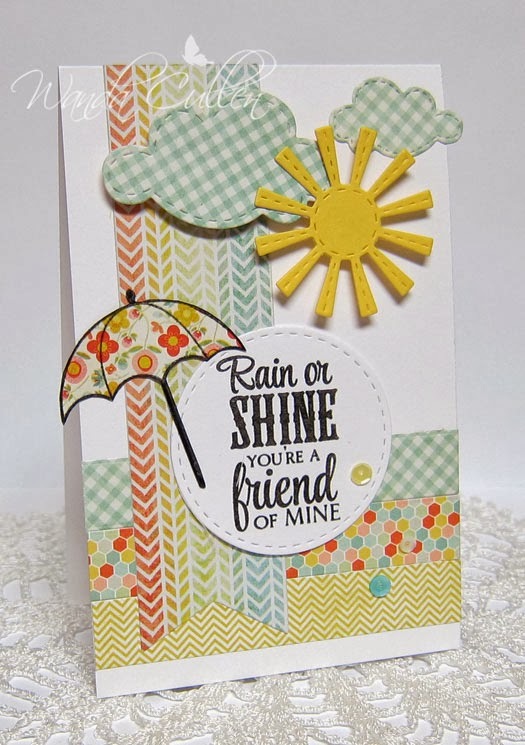 Julee has a fun sketch for the Mojo Monday Challenge and I just had to cheer on the sunshine by using a "Sunny Days" sentiment! I incorporated some sunny gold elements in the leaves, gold cording and gold sequins. Love the rich teal seam binding by Verve! 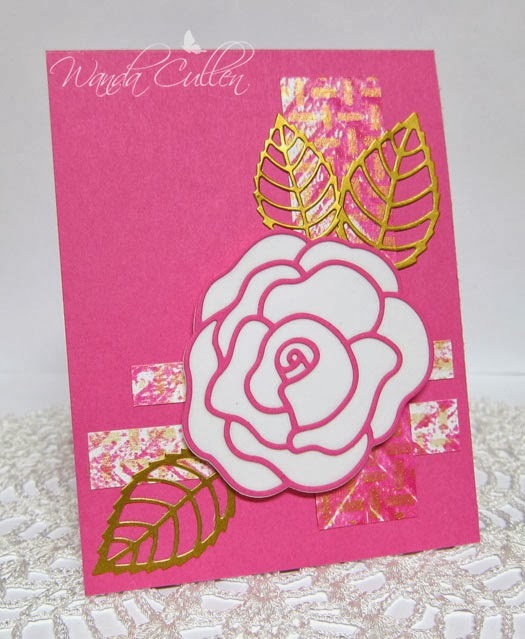 ACCESSORIES: Floral Circles die by Verve, Seam binding by Verve, Brad, Gold sticker leaves by MS, Sequins by Avery Elle, Stitched circle dies by Lil Inker Designs, Crimped rectangle frame, Square lattice EF by SU, Gold cording (SU), Corner chomper. I know Valentine's Day is over and done, but I'm still in love with hearts on cards, so had to go with at least one more this month! I tweaked the latest Retrosketches Challenge layout by tilting the square panel a wee bit. I also let the patterned paper do the work and simply added a clear embossed sentiment - stamped with Versafine Onyx Black pigment ink - on the postcard design. I thought this Verve flower imitated the doily design and layered it over the heart and leafy flourish. STAMPS: Bloom and Grow (flower), Love Notes (sentiment), Wings of Love (heart) - all by Verve. PAPER: Lost and Found 3 "Ruby" pad by MME, Vintage Cream, Riding Hood Red, Old Olive. INK: Blushing Bride, Going Gray, Versafine Onyx Black. 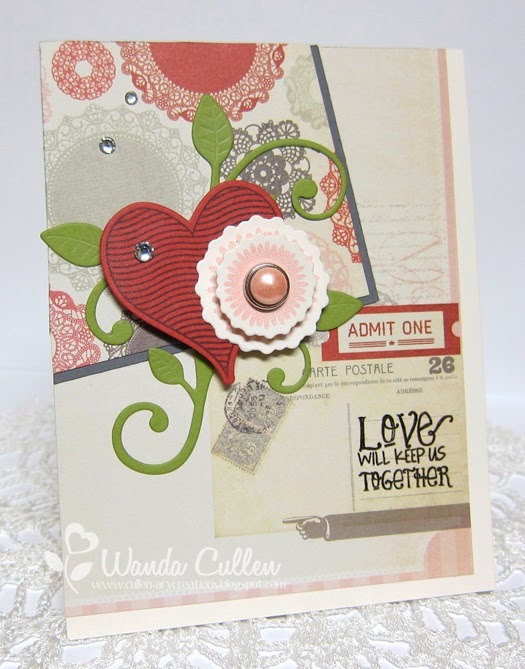 ACCESSORIES: Leafy Flourish Die-Namics by MFT, Wavy Hearts and Floral Circles dies by Verve, Rhinestones by SU, Brad. Have a great weekend! Looks like the 20" snow we got Wednesday and Thursday wasn't enough! Another front is to bring 1-2" more today! :-( Trying to be patient for the arrival of next week where temperatures will rise and be near 60 by the end of the week! Now, that's more like it! After stamping the sentiment (from Verve's Rain or Shine set) with Versafine Onyx Black pigment ink, I embossed with clear EP. The dies are all from Lil Inker Designs. The sun and card base are SU's retired Summer Sun CS. 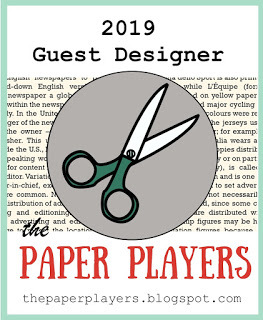 The designer paper is from The Sweetest Thing "Tangerine" pad by My Mind's Eye. 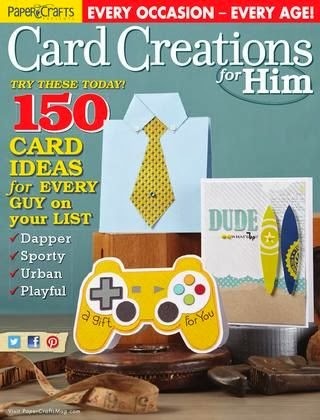 A quick and easy card to put together! 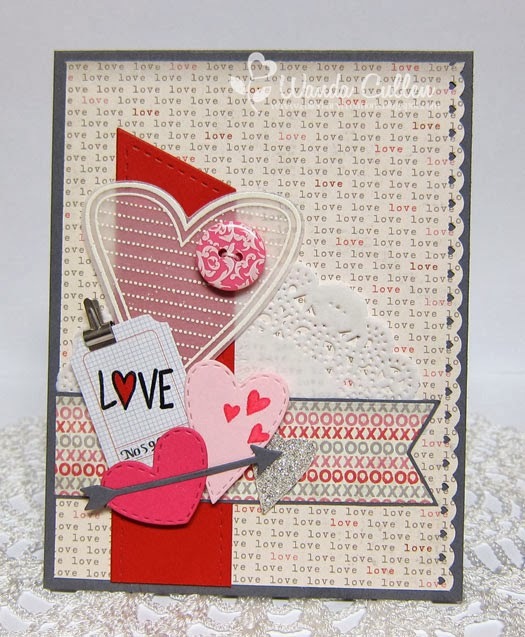 PAPER: Love Me 6x6 pad by MME, Basic Gray, Pink Pirouette, Melon Mambo, Real Red, Silver glitter CS by SU. ACCESSORIES: Jotted Heart die (Verve), From the Heart dies (Verve), Stitched Hearts dies & Diagonal Stitched die (Lil Inker Designs), Fishtail Flags Die-Namics (MFT), Button by Recollections, Mini library clip (SU), Paper doily, Ticket embellishment by Recollections, Martha Stewart heart border punch, Wink of Stella clear shimmer brush pen, White Opaque EP. Happy Monday everyone! Here's hoping you had a great weekend (I did because I was off work!) and now there's a brand new week and a brand new Mojo Monday Challenge! 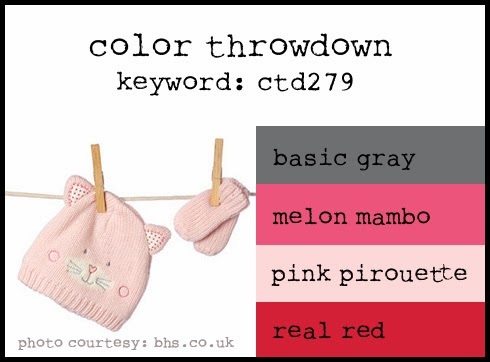 Tags and hearts....love, love, love Julee's sketch! While rearranging my paper stash recently, I came across this K and Co paper by Kelly Panacci that I totally forgot I owned. 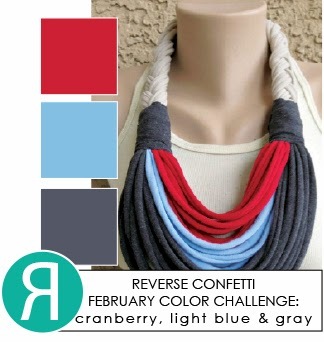 I used a tag die by Reverse Confetti and then it was layering time! A crimped jotted heart, some elegant leaves, a ready made felt flower, a sentiment banner and a sprinkling of Verve's pastel sequins...and there you have it. Another Valentine card completed! I've been selling them at work in case anyone wonders why on earth I need this many Valentines - lol! The border stamp of tiny green hearts is from Verve's Thankful Hearts set; the leaves are from their Bloom and Grow set and the sentiment from Small Phrases. Dies used: Jotted Heart (Verve), Elegant Leaves (Verve), Tag Me (Reverse Confetti), Staggered Heart Border Die-Namics by MFT. Ribbons: Certainly Celery and Rose Red by SU. Jute twine by American Crafts. 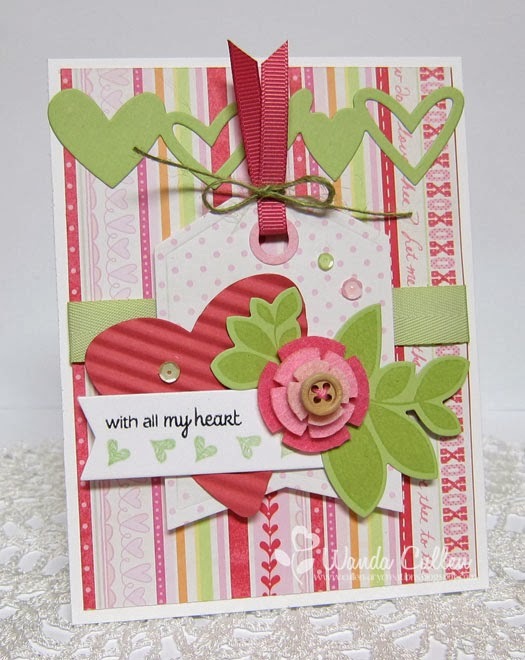 I'm playing along with the current CAS(E) this Sketch challenge by using ODBD new Ornate Hearts dies layered up as the focal point. My background is a square piece of cardstock covered with washi tape. 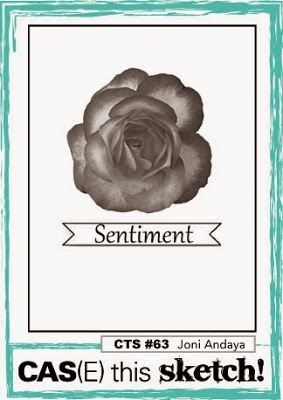 The sentiments on the banner are from ODBD Be Mine stamp set - also from their February release. PAPER: Real Red, True Black, White. 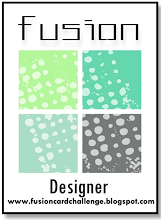 ACCESSORIES: Washi tape by Recollections. Banner die by Spellbinders. guest muse - Danielle Flanders! At my last visit to "Mike's", I picked up a sheet of Martha Stewart stickers in various gold leaf shapes thinking that gold is such a trendy element in papercrafting these days that I would find a spot for these beauties before long. Little did I know they would be perfect in CASEing Danielle this week! I struggled with the sentiment...started to go with sympathy...thought of wedding...and ended up with hugs! Well...THEN I remembered a coworker needed a 50th anniversary card (you know...the GOLDen anniversary) but it was too late. :-) Tomorrow is another day! I haven't used my SU Gorgeous Grunge set lately, so did some gold embossing with a couple of images. This was so easy to throw together and I'm thinking it will be a go to combination for many other cards. 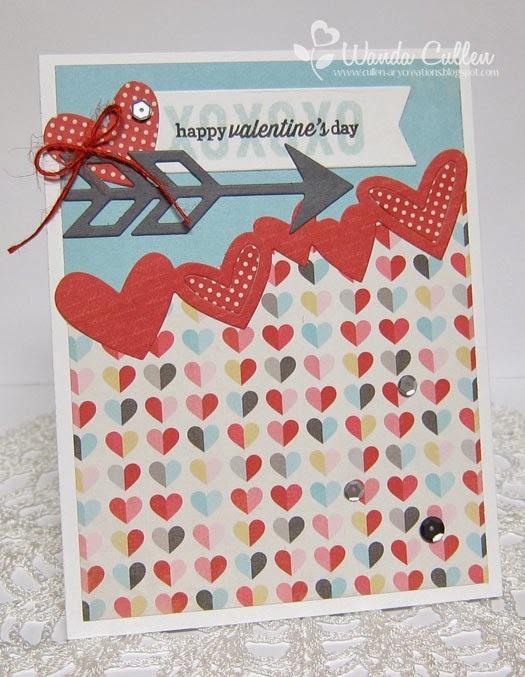 ACCESSORIES: Arrow and sentiment banner dies by Reverse Confetti, Heart border Die-Namics by MFT. Hope you're staying warm in your neck of the woods! Looks like more snow in our forecast! 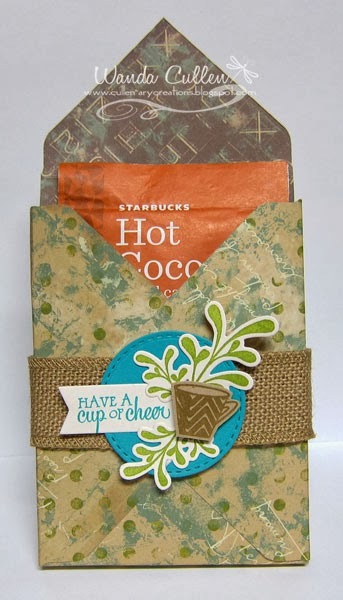 STAMPS: Holiday Treats (mug & sentiment); Sunny Days (leafy sprigs) - both sets by Verve. PAPER: School Days Alphabet Jungle DP by TPC Studio, Bermuda Bay, Vintage Cream, Kraft. INK: Bermuda Bay, Baked Brown Sugar, Lucky Limeade. 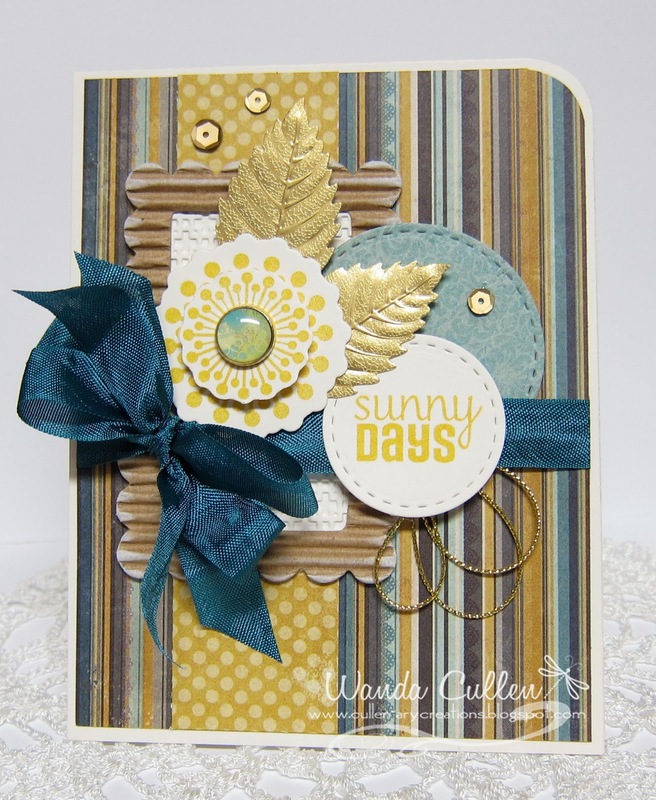 ACCESSORIES: Envelope punch board, Burlap ribbon by SU, Leafy Sprigs dies by Verve, Flag It Die set by Verve, Stitched Circle die by Lil Inker Designs.